So why are academics and students at Royal Holloway still calling on the Principal to speak publicly in support of his academics? 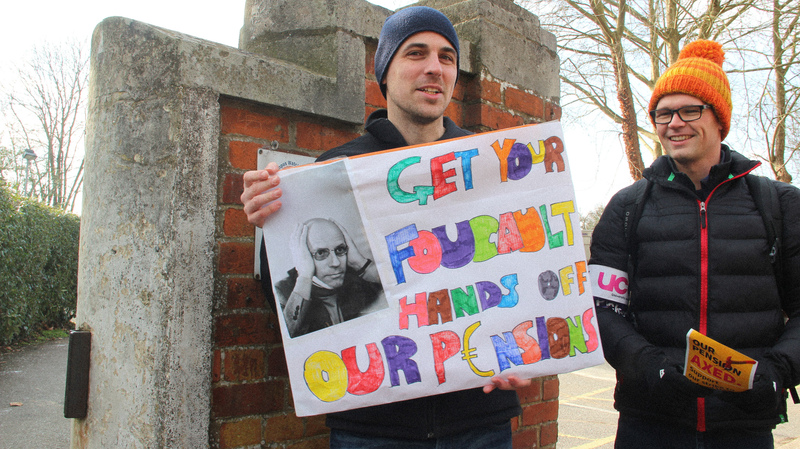 Other Vice Chancellors have taken a stand in their correspondence with both sides and stated that they would prefer their staff to receive a defined benefit pension. Most of the conversation around moving schemes in Lazyell’s letter, however, “is based around making sure that the new scheme is affordable for him,” claimed another academic. Other complaints highlighted that the letter stated there is a “limited time available to comply with Pension Regulator's timetable”, but that the Principal wasn’t helping this, or helping the strikes to end sooner by not joining in other university Vice Chancellors who have called for UUK to ensure that their staff continue to receive a defined benefit pension as part of a sustainable USS. There is a contested £17.5 million deficit in USS. The UCU claim that this deficit has been vastly exaggerated to enable universities to justify the running down of the schemes assets. The restructuring of USS would see the end of defined benefit pensions. Currently, pensions are a dual system combining defined benefit and defined contributions. Defined benefit is when an employer promises a set salary usually based on average earnings over the employees working life. This is the employer taking on risk as they are liable for paying this amount. Defined contribution sees employers and employees paying monthly into a pension pot that then adds to this defined benefit contribution, this is the employee taking on part of the risk as they are liable for paying this section of the pension. Together, both the employer and the employee through defined benefit and defined contribution pay into this pot. The proposed changes to USS would see the defined benefit portion of pensions cut altogether, removing that big risk shouldered by employers and putting it solely on employees. Pensions will then rely only on the contributions that employees make throughout their lifetime, instead of the employers extra defined benefit component. This loss will see an average reduction for the typical lecturer of £10,000 a year in pension salary and up to £200,000 over their lifetime. Furthermore, the new changes will see part of the pension tied to the stock market, making it further vulnerable to losses if there is an economic crash. UCU & UUK Re-Enter Negotiations, but Strikes Continue. On Tuesday in a meeting between UUK and UCU, both sides agreed to re-enter negotiations with ACAS as a mediator. The talks are due to start on Monday 5 March. UUK called for UCU to stop industrial action whilst they look for affordable, alternative solutions. UCU however, have stated that they will under no circumstance be calling off strike action until an agreement is reached. The new proposal that UCU are putting forward, they claim, will provide pension guarantees at half of the cost of their original proposal. It would mean that contributions to USS would increase by 4.1% (2.7% from employers and 1.4% for employees) rather than the 8.3% from the original proposal. In the majority, Royal Holloway students appear to be in support of the UCU strike action at Royal Holloway, with anger over missed classes directed more towards the Senior Management Team than striking staff. Student have braved the snow and demonstrated in support of UCU outside of the front gate, on every day of strike action so far. Students have been blocking the gate in an attempt to stop traffic and pedestrians from crossing the official UCU picket lines which have been outside Founder’s, at Piggery Gate, Spring Rise and Harvest Road. Posters have also been seen plastered around campus and the local area by students that call for Principal Layzell to resign. 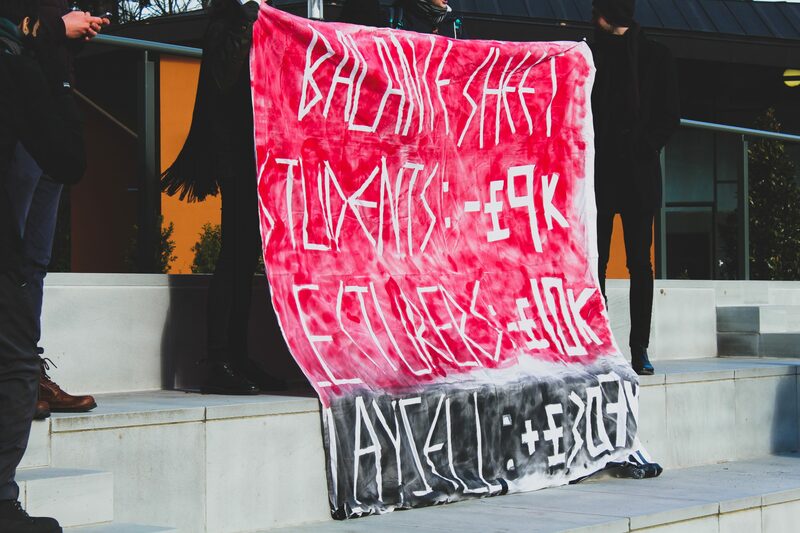 The posters claim that Layzell is guilty of “theft of pensions”, “rampant sexism” and “putting his wants over student’s needs” amongst other claims. On Tuesday, one group of students took to setting off flares in Founder’s Square. They told Orbital Magazine that it was “a demonstration against Senior Management”. 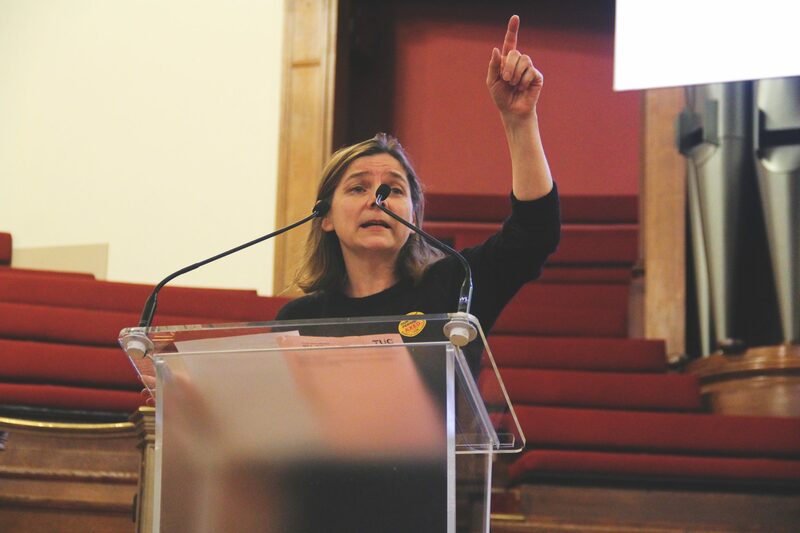 The Students’ Union took to an online referendum to overturn their stance on whether they should support the industrial action. In their biggest turnout in the last 3 years, 718 students voted, with 77.6% in support of the motion to “back UCU industrial action”. 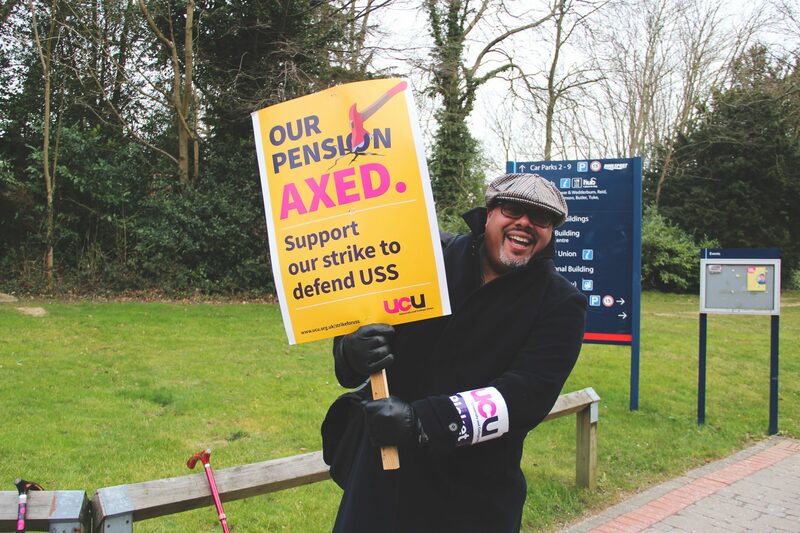 Following the advice of Universities Minister, Sam Gymiah, as well as UCU - Orbital Magazine are aware that many students have been emailing Principal Layzell asking for a refund on the tuition that they have missed due to strike action. Picket lines at Royal Holloway have had a good turnout by striking staff despite weather that on some days reached -8°C with windchill and saw heavy snowfall. 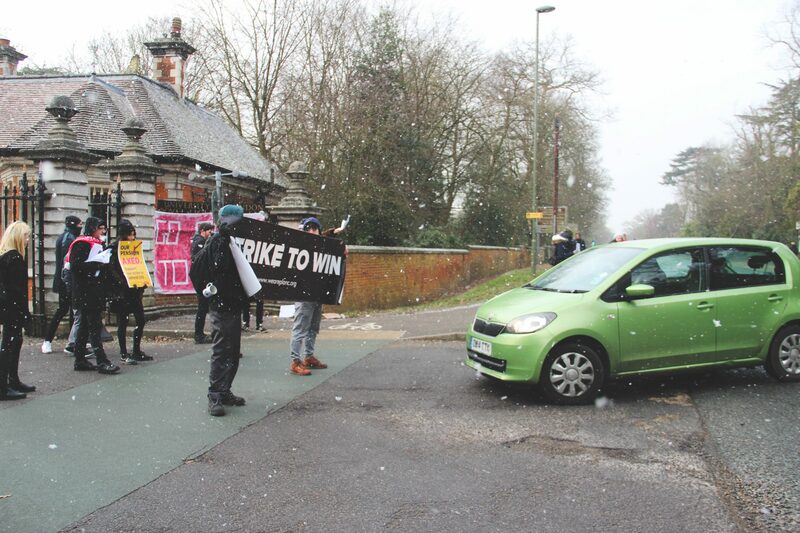 Official picket lines covered all entrances to Royal Holloway except for the picket line at the front gate, which it was agreed prior to strike action would take place on campus in front of Founders’ Building due to safety concerns posed by the A30. Picket lines have also been present at Bedford Square, part of our central London campus, each morning. But picket lines at Royal Holloway are noticeably smaller than those at other universities. Why is this? Government guidelines of picketing state ‘that in general the number of pickets at any workplace entrance or exit should not exceed six’ and thus you will see picket lines across Royal Holloway in small numbers. This guideline, crucially, isn’t law, but at Royal Holloway it is being policed and enforced at an unusual level. Other picket lines across the country have seen many more than six staff members present, which as long as they do not act in an intimidatory nature, are allowed to remain. Mark Smith, Head of Security, at Royal Holloway has been consistently asking staff members to disperse on our picket lines as per orders from Director of Human Resources, Gill Hemus who recently came under fire for leading the most hardline approach to striking staff members in the UK. Security has claimed that the guideline is being enforced due to the fact that picketing on the front gate takes place on campus as opposed to outside of it. However, picket lines at entrances such as Spring Rise and Piggery Gate were still asked to have no more than six members. 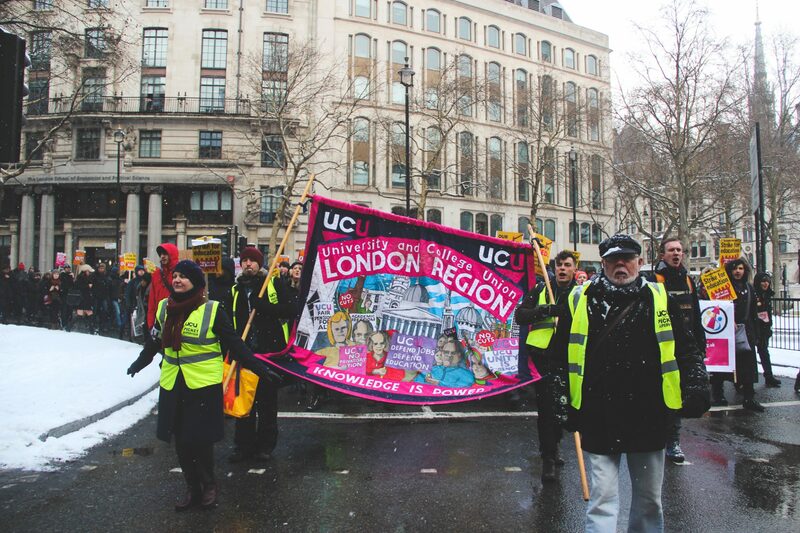 On Wednesday, Royal Holloway staff joined over 5,000 others from London branches of UCU in marching from Malet Street to Westminster as part of the “Defend Our Education” demonstration. Orbital Magazine are proud to support and document our striking academics. 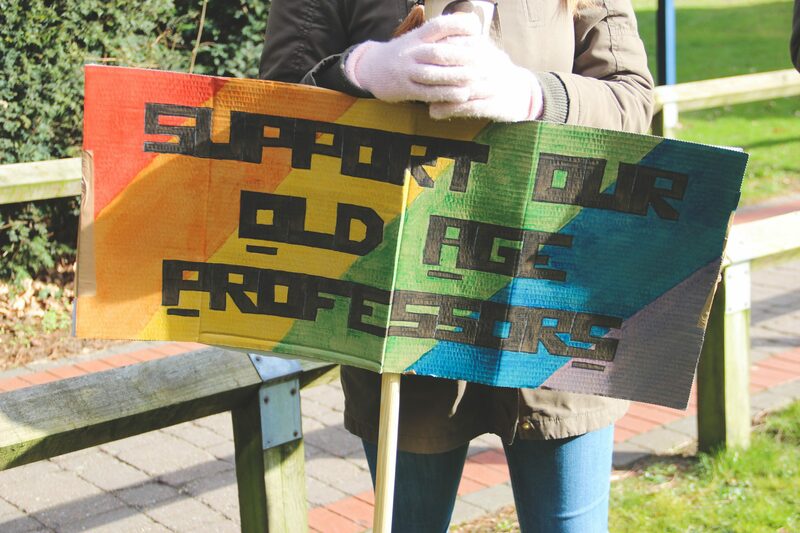 For the latest coverage straight from the picket line follow @TheOrbitalRHUL on Twitter and our reporting hashtag #RHStrikes. Words by Abbie Cheeseman and Emma Halahan. Photography by Emma Halahan and Michele Theil.